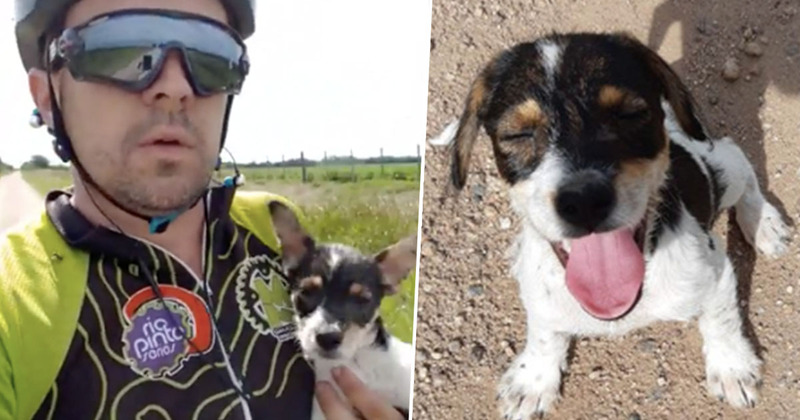 A desperate stray puppy was overjoyed to be rescued as a cyclist spotted her miles away from town. Cross-country cycling enthusiast Damian Macchi was on a routine training ride near his home in Argentina, riding down a remote dirt road when he spotted something moving in the undergrowth lining the path. At first he simply carried on his way, but before long a sense of concern came over the cyclist and he decided to turn back to investigate. It seemed the dog had been abandoned, and judging by her squeals and the amount her tail was wagging she was certainly excited to have been found. Knowing he had to save the poor animal, Damian scooped her up and turned his training ride into a rescue mission. With one hand holding his new little friend, the cyclist made his way home. The dog seemed to love her journey on the bike, evident in the way she gazed up happily at her hero while the wind blew through her fur. The cyclist took the loving dog to the vet for a checkup before posting about her on social media, and it wasn’t long before the stray found her forever home with some deserving new owners. The dog was adopted. They named her Juanita. She’s happy with her new family. The heroic man explained that aside from needing treatment for ticks, Juanita was doing well. Damian has been involved in a number of animal rescues in his time, and in spreading the story of the rescued pup he hopes more people will be encouraged to try and re-home unwanted dogs, rather than abandon them. I want to make people aware that they should not abandon. People should definitely take note of Damian’s words – no dog deserves abandonment! The cyclist was a true hero for rescuing Juanita.